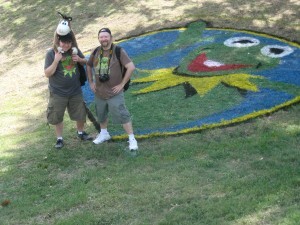 Leland Frog Fest- just a hop, skip and a jump down Hwy 61! 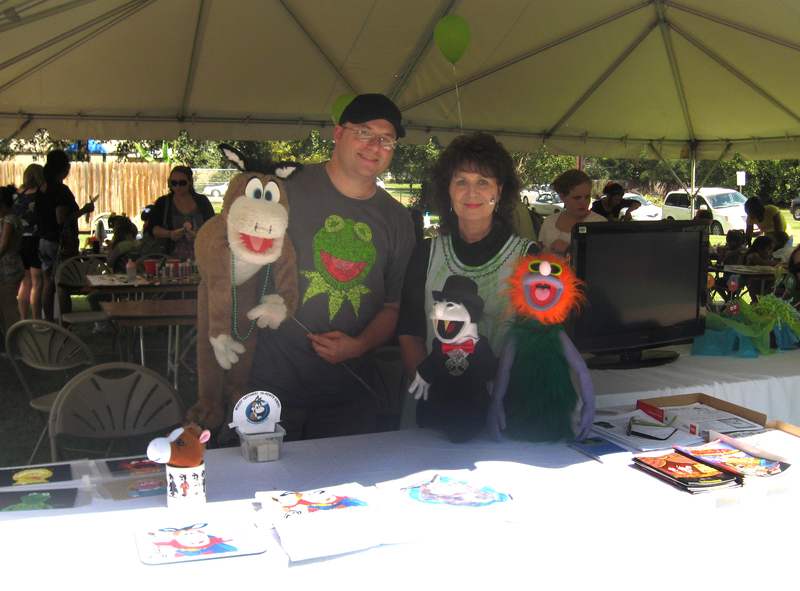 This past Saturday I attended the first Leland Frog Fest in Leland, MS– the birthplace of THE frog, and former hometown of his creator Jim Henson. 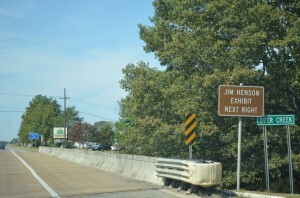 Jim was born in nearby Greenville, MS (kinda fitting!) and spent a lot of his childhood playing along the banks of Deer Creek and attending school in Leland. 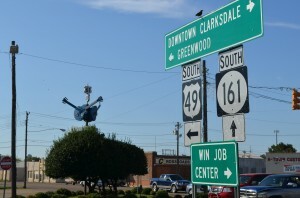 Leland and Greenvile are located next to each other and only a couple hours south of Memphis, TN and Tunica, MS- just off Highway 61, or “The Blues Highway” as it is also known as. I headed out early Saturday morning from Hernando, MS and took 1-55 to I-69, then 304 towards 61- through Tunica, Clarksdale, and Cleveland, MS. It was nice to see many of the cotton fields in bloom, and loved watching the crop-dusters buzz the highway as they went back and forth spraying the fields. 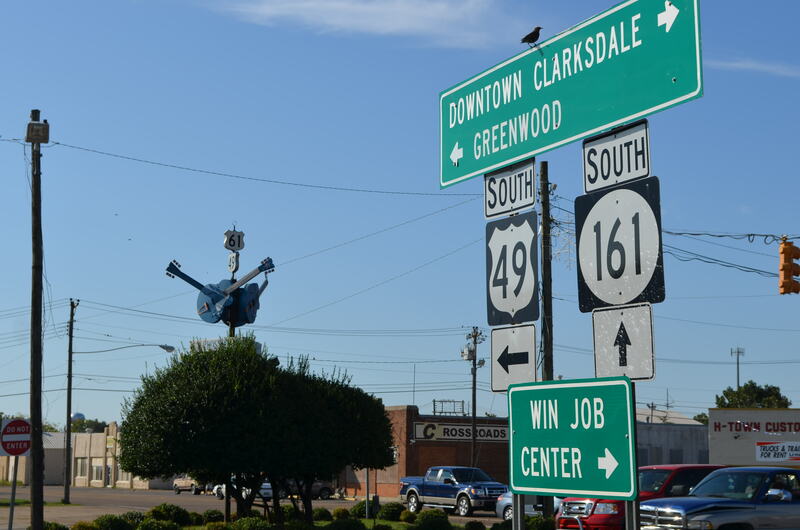 About halfway there I decided to stop in Clarksdale to search for the crossroads– not to sell my soul to the devil, but to see the guitar marker there. Besides, in this economy I don’t think I could get much for my soul, and my fiancée Nicki won’t let me sell anything that already belongs to her! I stopped by their tourists center after leaving Hwy 61 onto Hwy 49. It was just off the highway, but closed. 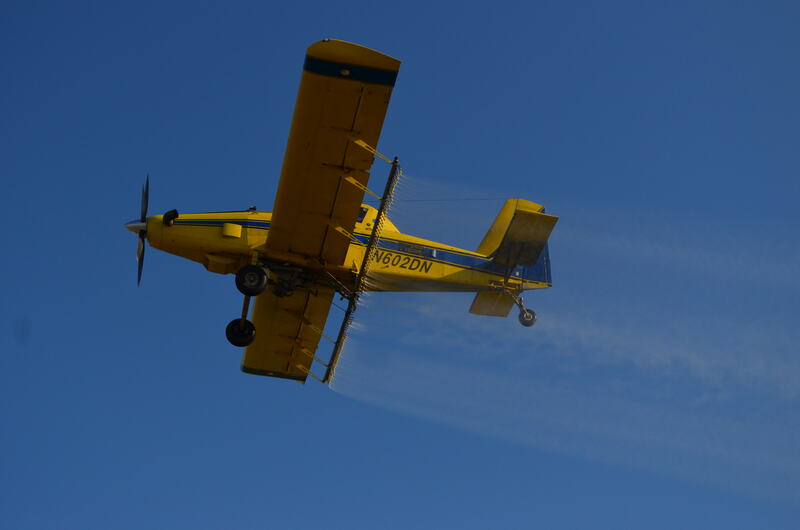 I did get a few shots of a crop-duster as he flew over the tourist center while spraying the field out behind the building. 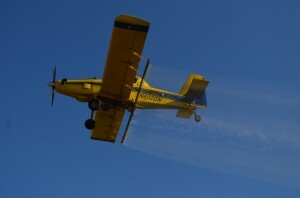 Wasn’t sure what he was spraying so I didn’t stick around long. I jumped back in the Batmobile, fired up the atomic batteries, got the turbines to speed and moved out of their parking lot and on into town. 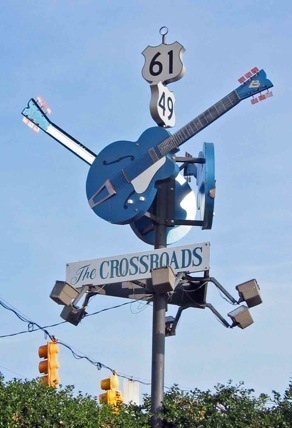 I followed signs for the blues museum and found the crossroads monument I was looking for just a few minutes later! I stood at the crossroads taking a few more pics and then drove down 49 a bit further following more museum signs into downtown. Lots of cool old buildings there, and I was happy to have the Delta Blues Museum in Clarksdale open up just after I got there! It was time for a much needed pit-stop, and I wanted to pick up some blues music for the car. I only had some Saliva CDs in the Batmobile, and although I love this Memphis band, it just wasn’t what I needed for the rest of the trip through the Mississippi delta. 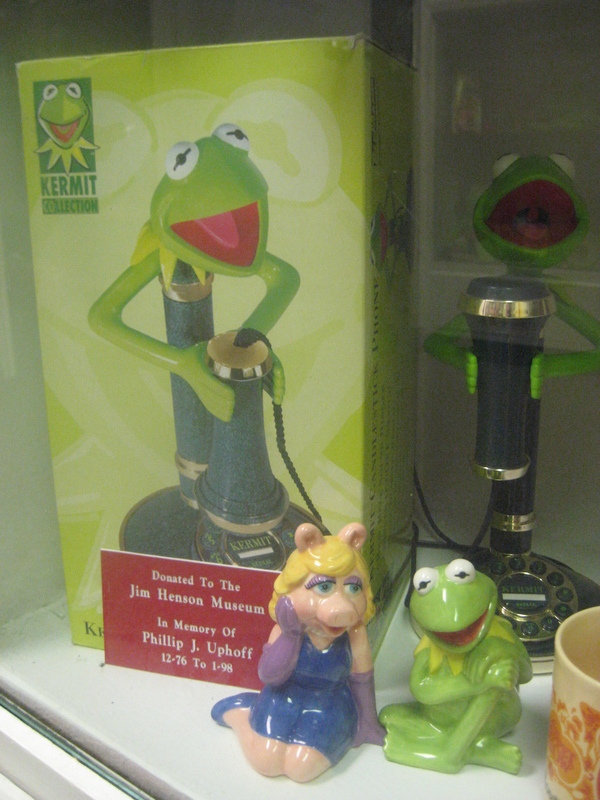 The gift shop was fun and the museum building looked interesting, but I would have to tour the museum later- had places to be and frogs to see! Since I had just passed by the crossroads on the way into town I bought a Robert Johnson CD in the museum’s gift-shop, then headed back to the crossroads, gassed up the car, took few more pics of the guitar monument, and drove up Hwy49 towards Hwy61. 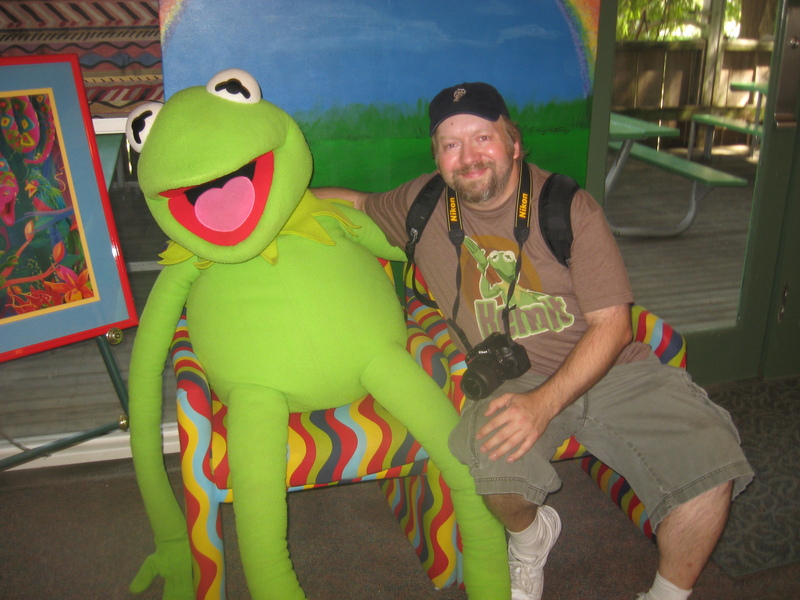 I’ll post more about that part of the trip later- it really needs it’s own blog post, and I plan to do a Hwy61 blues tour and go back to Tunica, Clarksdale, and Leland to visit their museums later this fall before it gets too cold- or too hot next summer! The museum (which is housed inside the tourist center and chamber of commerce building) is just about a mile and a half off Hwy61 at the Greenville exit (W Hwy 82- which I’ve missed twice now) and on the right just as you cross over Deer Creek. 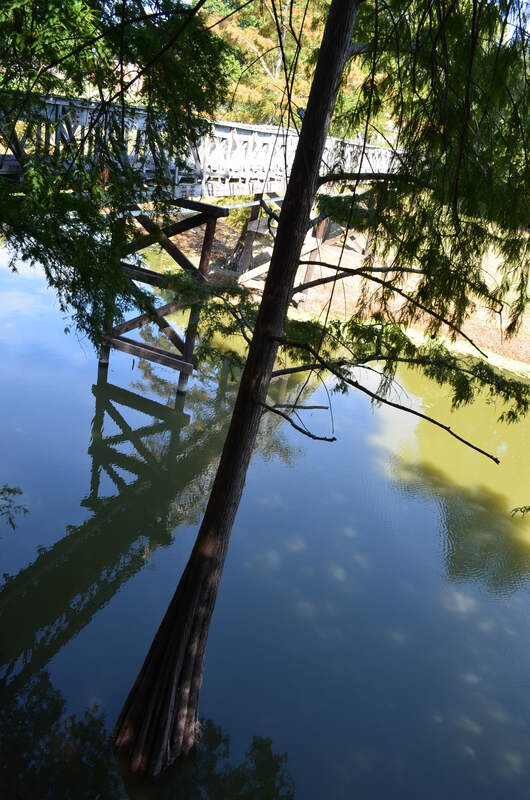 It is literally “on Deer Creek”, and has a picnic deck area at the rear of the building that stretches through the surrounding trees and out over the water. It has a great view of the creek, trees, bridges, and some of its inhabitants- turtles! Didn’t look hard enough for frogs, but the turtles were easy to spot up and down the creek. A large cut-out portrait of Kermit was on the front of the museum welcoming visitors inside. 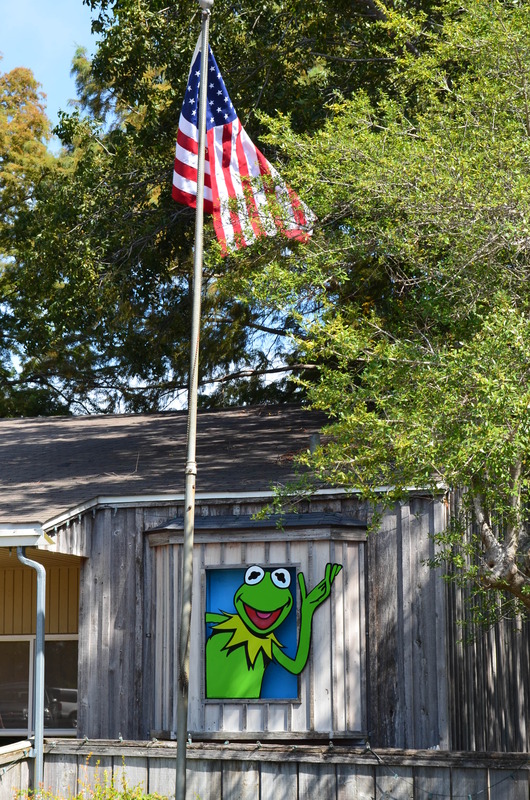 The outside of the building is very rustic looking and not what you might expect of a “Muppet museum”, but it fits in perfectly with its surroundings on Deer Creek, and looks like someplace Kermit and Jim would be very comfortable hanging out in while back home in Leland for a visit. Inside it’s a bit more spacious than it looks from the outside. I’ve seen some bigger museums similar to it, but this one is much more professional looking (clean/good displays/well lit/current). The really neat thing about the museum its ability to keep things kid friendly and interactive, and has a much warmer and down-home southern vibe to it than others. 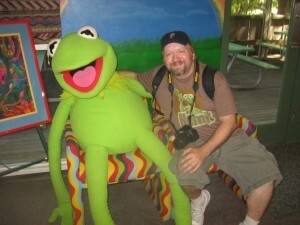 The staff are very friendly and love talking about the town and it’s famous frog. Everyone there seemed to be having a great time! It is a small space, but they use what they have very well and have it broken up into different areas. In the main room- on the right as you enter there is a welcome desk and visitor registry book, restrooms, and a wall of framed photos; on the left side they have a small viewing area with chairs and a monitor for watching videos about Jim Henson, a bookshelf of Muppets and Sesame Street books, more framed photos and art, and doors leading to a collectibles room and the gift shop (more more pics inside in my blog “Toadal Recall“) and Facebook page; two large display cases in the middle of the room and house Muppets that starred in “The Song of the Cloud Forest” from The Jim Henson Hour in the left one, and a Kermit playing the banjo in the right one (on loan from The Jim Henson Legacy); the rear of the building on the left side corner has a large stuffed Kermit doll sitting on a couple of rainbow colored chairs under a rainbow backdrop, a photo display on the right back corner, and doors to the decked picnic area and overlook in the middle. It was fun to look around and see what had changed since the last time I was there and what had remained. It looked fresh and familiar all at the same time! When I walked in I noticed some familiar faces who had been working there back on my first trip to Leland, but I also noticed a new face- Miss Mississippi, Mary Margaret Roark, who is very hard to “miss“! (Get it..?) The new Miss Mississippi is a native of Cleveland, MS just up Hwy61 a bit. She was signing photos and posing for pics with many of the kids at the museum, and later posed for a photo with our friend Muley, and even sang with the local Delta Children’s Choir at The Rainbow Connection Bridge dedication. 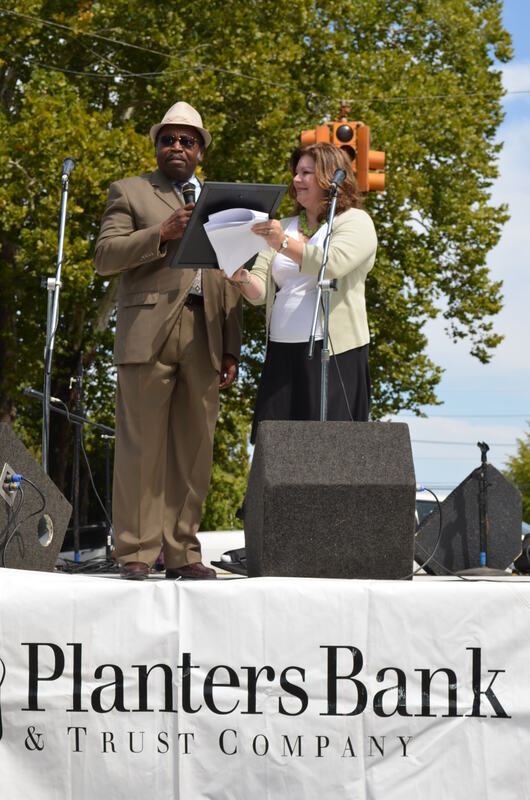 Speaking of the bridge dedication, I had to get a move on if I was going to make it there by noon. I had waited to “hop” on the shuttle bus, but got distracted and missed it once, so I figured I’d just hike up Deer Creek Drive and along the creek to the dedication ceremony. 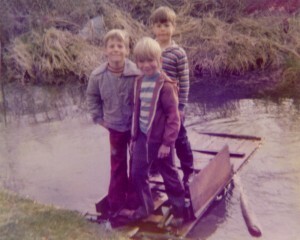 I’d been over the bridge before, but even if I hadn’t it would have been pretty easy to find! 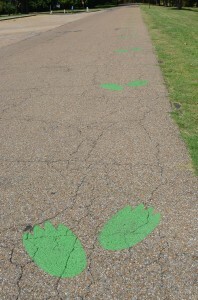 The city had painted green frog feet on the road from the museum up to the historical marker on the N Broad St. Bridge- which was soon to be know as “The Rainbow Connection Bridge“. It was about a half mile or more trek “up the creek”, but the weather was nice, the scenery was great- and a few minutes later about 100 yards or so from the bridge I passed the shuttle bus heading back the opposite direction to the museum! Oh, well- I needed the exercise and enjoyed the same stroll as Jim had probably made many times as a boy in Leland. When I grew up in Utah we had a creek that ran beside our yard and I fished, waded, and floated rafts in it every summer- yep, that’s me in the middle up front. This creek reminded me of it- just a bit bigger. I could see having a lot of fun here as a kid. 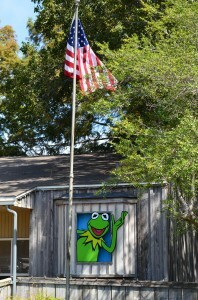 As I approached the bridge I noticed a large Kermit painted on the creek bank’s grassy left side, and a green covered sign in the middle of the bridge. 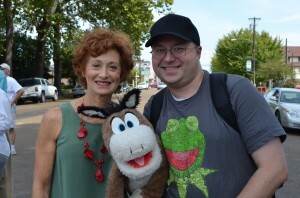 Once I reached the bridge I ran into Kevin Williams and Muley the Mule. We walked, talked, and took pics around the bridge before the dedication ceremony started. We had a few minutes to kill and lots to take in. Our emcee Anne Martin welcomed us all to Leland and the Frog Fest, thanked the sponsors, and told us a bit more about Jim Henson, the festival, and bridge. 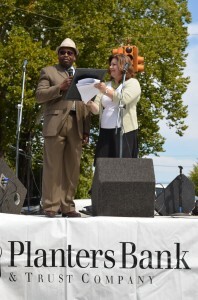 She then introduced us to the mayor of Leland, James Lowe who read a proclamation from the City of Leland. 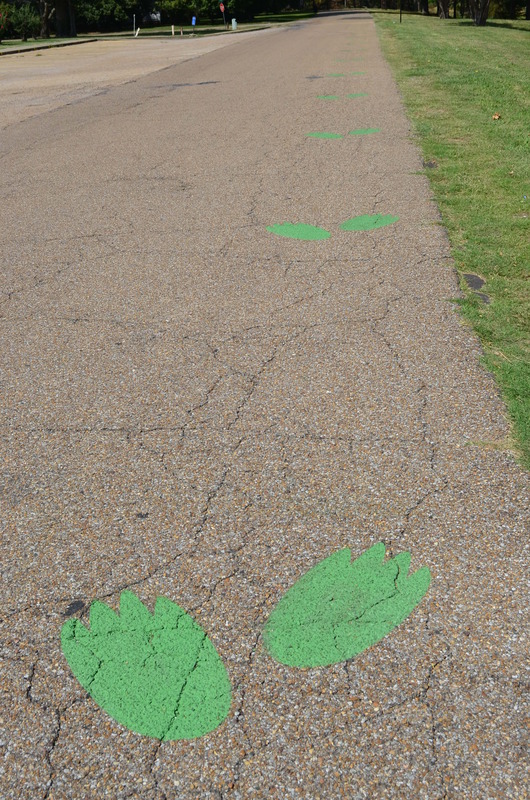 He also pointed out the new frog feet and freshly painted “Kermit green” railings along sides of the bridge. They had spruced things up a bit since the last time we were there. Kevin and I had found a good spot down front and he took some video while I shot stills with Nicki’s new camera she let me take along on the trip- thanks, Nicki! Up next was special guest Fran Brill from Sesame Street, and the The Jim Henson Legacy’s vice president. 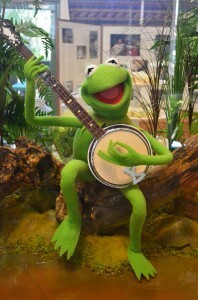 Fran was the first female puppeteer hired by Henson for Sesame Street, and has performed the characters of Prairie Dawn, Zoe, Little Bird, Polly Darton, Mrs. Crustworthy, Elmo’s mom, Scottish Mary of “Mary had a Little Lamb”, Bo Peep, Roxy Marie, the Countess and many, many others. Kevin, Muley, and I were lucky enough to meet her earlier before she went on stage and got a couple Muppet books signed and took some pics with her. Found out later that she had been stuck at the Memphis airport the day before due to bad weather, and I had just been there to pick up Nicki from a St. Louis flight that night! I’ve heard that a lot about guests headed to the Superman Celebration in Metropolis, too. I usually get stuck in Dallas when I fly. 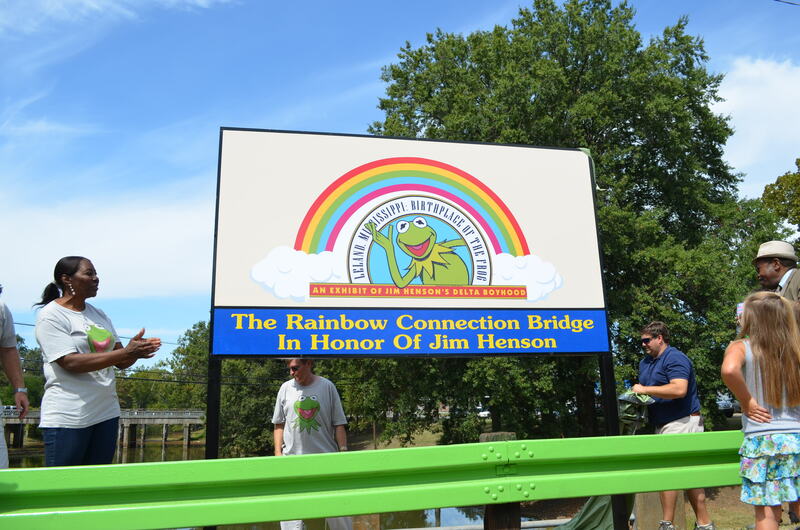 It was finally time for the sign unveil and green balloon release to make it all official. The Broad Street Bridge was now The Rainbow Connection Bridge! The ceremony closed with the Delta Children’s Choir and Miss Mississippi singing “Rainbow Connection“, which was very sweet and fitting. After that the staff threw out some green beads from the stage, and later the Port City Jazz Quartet and a magic show performed there on the newly re-named bridge. After we packed up Kevin’s table I rode back to the museum in the “Momma-Van”. 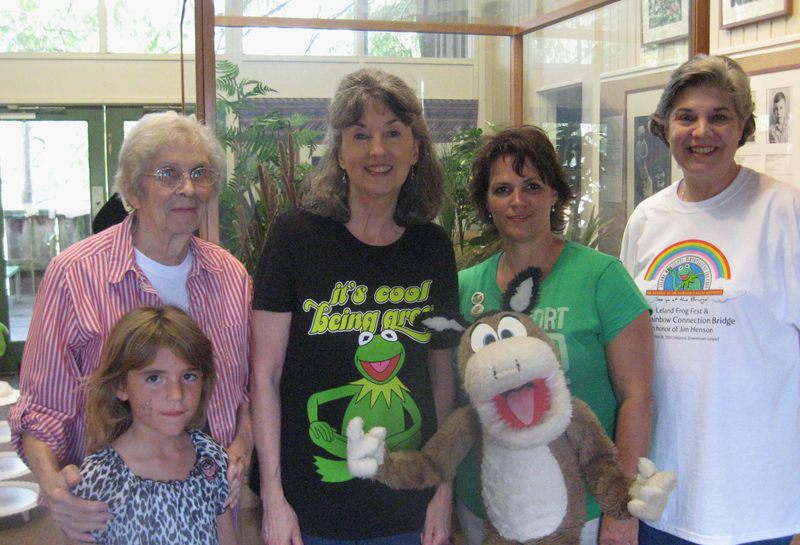 We took another quick tour of the place, hit the gift shop again, watched a cool new video about Kermit and Jim Henson, and said our final goodbyes to the staff and volunteers in Leland. Kevin and I dropped his mom back off at their hotel room in Greenville, then he and I grabbed some dinner in town before I called Nicki to let her know I was on my way back home. The drive home seemed much longer in the dark, but it was well worth it to experience Frog Fest and see our friends in Leland again. 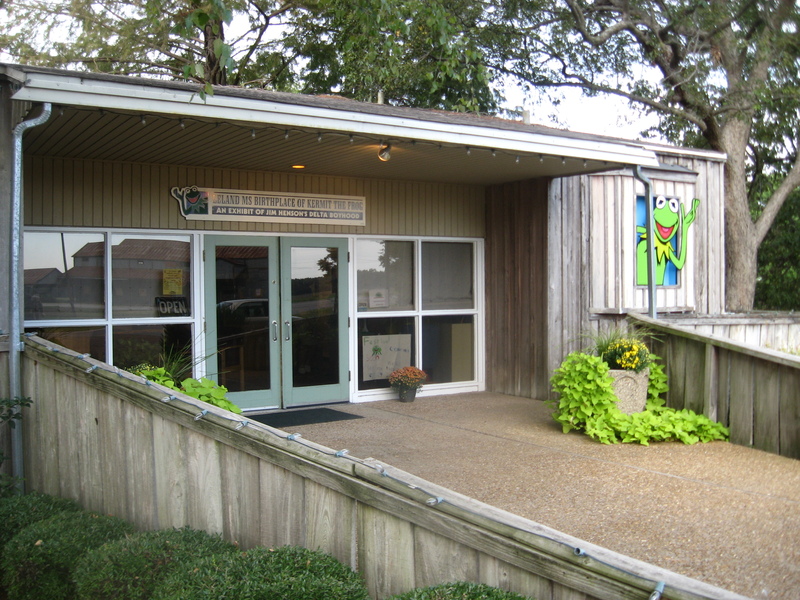 Directions: The Exhibit is located in Leland, MS on the bank of Deer Creek, one and 1/2 miles west of the intersection of HWY 82 and HWY 61. Hours of Operation are Monday-Saturday 10am-4pm. Gift shop located inside museum. Christmas parade floats on Deer Creek in December! Great update, Lin! It was really good to see you down there at Leland!